CONS: Not enough oomph. No wi-fi. 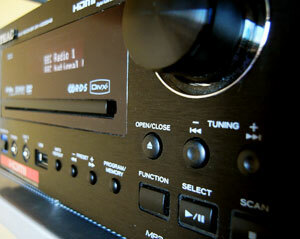 Compact receiver with DVD playback in a stylish package. Looking dapper with its old-school looks, stylish brushed steel finish and promising oodles of hi-fi goodness is Teac's DR-H300DAB DVD Receiver. 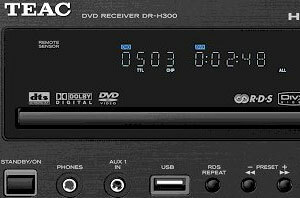 Aimed at space-strapped folks looking for a lorra entertainment without the need to fill up the room with half of ton of cables'n'components, the DR-H300DAB packs a CD player (CD-R/RW, MP3, WMA, PictureCD and DivX; 3.11, 4.x, 5.x) and a DAB/FM RDS receiver. Unusually, there's also a DVD player onboard offering 14bit/165MHz Video DAC and Progressive Scan and happy to play back SA-CD, DVD-Video, DVD+R/+RW, VCD and SVCD formats. Underneath the large LCD display, there's a handy front mounted USB slot letting you slam in your USB stick or portable device and play back any stored images, movies and music files, with the adjacent headphone socket keeping the neighbours happy at night. 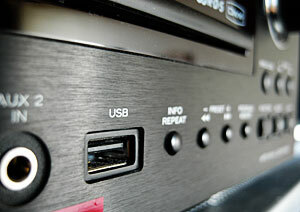 Taking a peek around the back, there's a fair few connectivity options to be found, including composite video out, Scart, audio: in x 2 out x 1, optical and coaxial digital out, sub woofer pre out and binding-post speaker terminals. 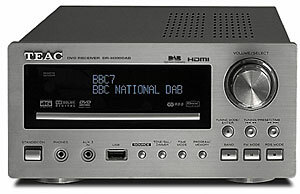 We encountered no major problems in using the controls of the Teac, although some gripes quickly surfaced, the most annoying of which was its habit of turning on the TV every time we put in a CD, because it wasn't smart enough to work out if it was an audio or a video disc. We didn't like the push button function selector making us cycle through all the choices every time either: a rotary switch would be far better. We could have used a few more inputs too. As with most mid-price receivers, the CD/DVD tray was a flimsy looking affair and not something to be trifled with after a few pints. The remote control, while mot exactly a looker, was functional enough. Pleasingly, the A4, 60-page manual didn't offer the usual United Nations roll call of a zillion languages (including Klingon), but every page was in English with the large text and clear illustrations helping users get to grips with their new purchase. However, we still found ourselves having to consult the manual one or two times more than we'd like as some aspects of the unit's functionality wasn't as obvious as we hoped. Or perhaps we were just being a bit thick. The Teac did a pretty job playing back DVDs through a conventional TV and it even had a pretty good stab at upscaling to 720p and 1080i video resolutions, although a few jagged edges and over-bright colours occasionally gave the game away. We had no problems playing back both JPG files and camera movies stored on a USB stick, although the interface is a bit clunky and reminiscent of ye olde Windows95. We paired the DR-H300DAB with a pair of the excellent Eltax Monitor III speakers which at �70 per pair are a good example of the kind of budget priced units that average buyers might consider. Slamming in a few of our favourite CDs we were immediately impressed with the smooth, accurate soundstage with a crisp mid range and none of the harsh treble screeching you can sometimes hear on mid priced systems when they're pushed hard. The bass proved fairly weighty if a little light for our tastes - 'ardcore drum and bass nuts might want to make use of the sub woofer output. We were a bit disappointed with the volume - the speakers we were using were pretty efficient but we felt a little short changed when we cranked things up, although it should be plenty loud for most users. There's no bass or treble controls, although there's four preset options for classic, jazz, rock and pop. None of then improved the sound in the slightest, so we stuck to the 'flat' option. There's also a 'superbass' and 'loudness' button that did equally ghastly things to the sound, over-compensating the bass to produce a over-rich, bottom heavy sound. On a whim, we did some A/B listening tests with a 15 year old Audiolab 800A amp, a venerable audiophile British amp that can be picked up on eBay for around �100. We thought that the onward march of technology would have seen off the old Brit veteran, but it absolutely blew away the Teac. The bass was deeper and tighter, the mid-range warmer and tighter and the whole listening experience was more 'musical'. Although the lack of Wi-Fi and onboard hard-disk storage stops this from being a truly modern entertainment system, its keen pricing, decent sound, useful USB port and DVD functionality makes it a good choice for the bedroom or smaller living rooms. 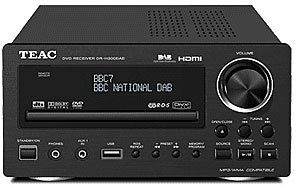 So long as you're not looking to recreate a Motorhead concert in your front room or lusting after true high fidelity performance, the DR-H300DAB is a well balanced, good sounding CD/DVD player/DAB radio combo that serves up decent video quality in a compact package that won't break your bank balance or dominate your room. It's fairly straightforward to use, does just about everything you might ask of it, and is pretty easy on the eyes too. 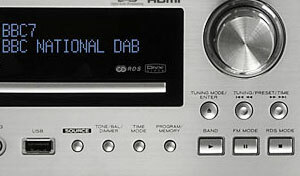 Available in either shiny silver or moody black, the DR-H300DAB comes with an Internet price hovering around �250-�290, and we'd recommend it as a good all-rounder well worth considering.